Wayne County is comprised of many major cities in Michigan including Detroit, Plymouth, and Dearborn. With nearly 1.8 million inhabitants, Wayne is Michigan’s most populated county. education, and health care preparedness to its residents and community in order to address the social determinants of health and community wellness. education on health and related threats, location services, and safety news within the Wayne County area. Before development of any app, we architect and outline how the application’s content will be organized, structured, and shared across user devices. Keeping in mind Wayne County’s goal to conduct external communication with the public, this effort included utilizing a real-time data feed with Wayne County’s website and integration with Amazon Web Services to provide urgent public health alerts with push notifications. 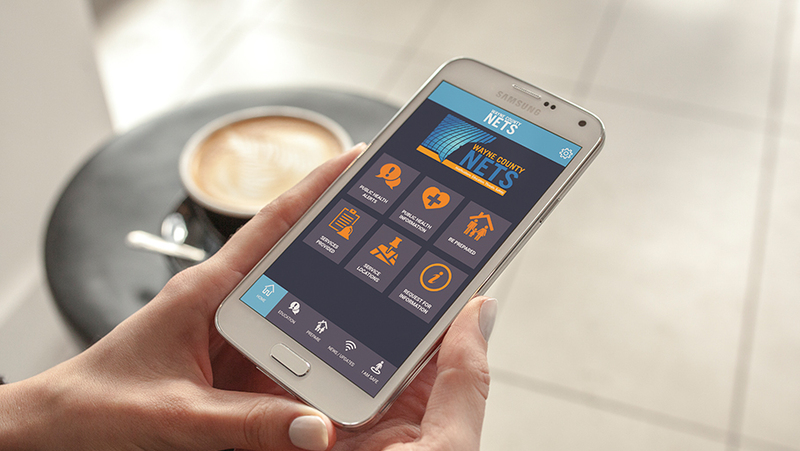 We developed the app Wayne County NETS (Notifications, Education, Threats, and Safety) based on the requirements provided to us from Wayne County. The application is compatible with iOS 9.0 and newer for Android 4/4 and newer. This process diagram, known as a workflow, displays the planned functionality of the buttons on the home screen and how those buttons direct the user through the app. The workflow also shows the organization and structure of the app’s functionality and what will be visible to the user on the screen. This workflow displays the functionality of the app’s main home screen navigation. It also notes what and how the information will be pulled into the app. In this case, some of the content was being pulled from Wayne County’s website, as depicted by the JSON feed notations. Wireframes connect the structural concept of the app to the visual design. It is an implementation of the design into the screens planned from the workflow.